In this post we learn about Lauren Taylor, an elementary school educator, who built a Power Platform solution to improve the reading assessment process for students and educators. Lauren is an Assistant Principal at Manitou Park Elementary, part of the Tacoma Public Schools district that’s located in the state of Washington in the United States. Lauren has no formal IT background. 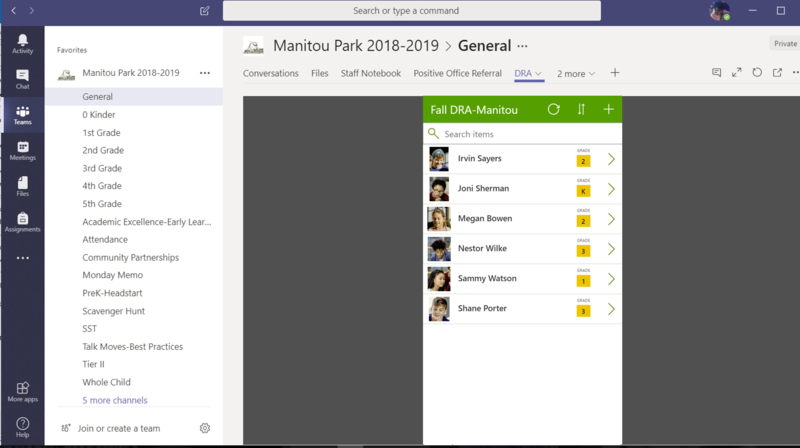 She learned the Power Platform technologies – PowerApps, Microsoft Flow and Power BI on her own, and used them along with SharePoint Online and Microsoft Teams to enable teachers to capture detailed information about student reading levels that was simply not available earlier. The solution is currently in use at one school with the potential to go district-wide in the future. 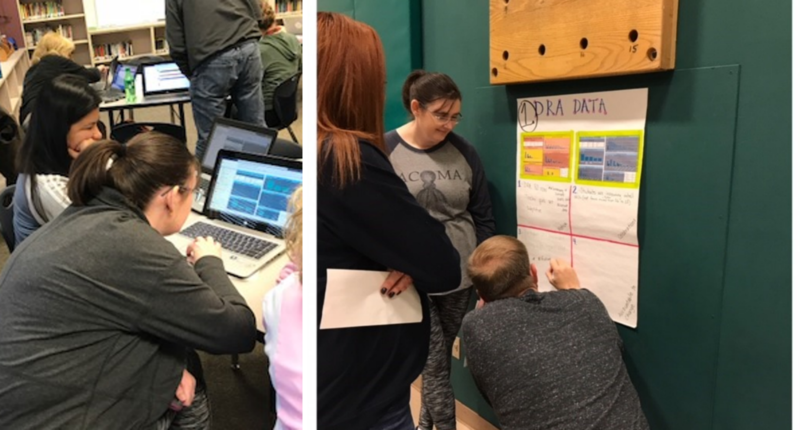 Tacoma schools use the DRA2 (Developmental Reading Assessment, 2nd Edition) where teachers sit and read with students to assess their reading level and abilities. They systematically observe, record and evaluate how a student’s reading performance changes over time, and use it to set reading goals for the student to focus on. The assessment is performed three times a year with ongoing progress monitoring approximately once a month. According to Lauren, the one-on-one time that teachers spend with students is time consuming but worth it. 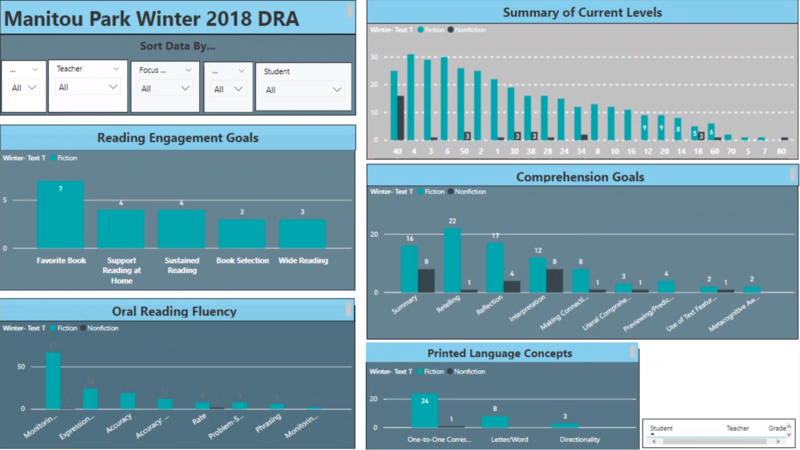 Teachers and administrators needed a digital solution to record and organize detailed information about student reading levels so they could better assist individual students and view aggregate data across the classroom to enable better grouping of students. To complete the DRA2 assessment, teachers have a big paper packet with a list of questions that they fill out, along with a scoring rubric. A single score is then recorded digitally in a district-wide electronic system while the rest of the information is only captured on paper. Since capturing the additional information was not required, some teachers recorded just the score and no more. Rich information from the assessment (beyond a single number) was not being captured in any structured manner. It was not easily accessible later. Teachers would come up with the final score (e.g. 28) and set a goal (e.g. 30), but it was never clear what’s behind the score. What does the individual child really need to get from 28 to 30? Children were put into groups based solely on the single number, which was not always ideal. It was time consuming to sift through papers. So although the paper forms were readily available they were not always used to determine student and class reading goals. Lauren Taylor, Assistant Principal at Manitou Park Elementary, had some prior knowledge in Power BI. She had played around with dashboards but as such had no formal IT training. In the summer of 2018, Lauren was exploring products in the Office 365 suite. She discovered Flow and explored using it to automate getting data into Power BI. While speaking with someone at Microsoft he asked if she had heard of PowerApps. Initially Lauren was hesitant but as she was learning SharePoint, she learned how to make a list and discovered the “Create an App” button in the SharePoint list. She went on to tell her principal, “I think I can make a PowerApp to get my DRA data visualized”. She showed her the initial version, and they decided to roll it out in a month. The first version was rolled out in Nov 2018. They got teachers together, who took their existing DRA2 packets and loaded the data using the PowerApp. Teachers use the PowerApp to enter detailed information from each student’s reading assessment, beyond a single number, such as oral reading goals, comprehension goals, etc. The teachers access the PowerApp from their mobile device or Surfaces provided by the school. For Lauren, the aha moment came when she saw how she could make an awesome Power BI dashboard to view her DRA data. She, along with the staff, go into the dashboard and with a couple clicks group students based on different categories such as comprehension or oral reading goals. They were pleased to be able to do all this without needing to interrupt the teacher. Lauren used Flow to add SharePoint list items into Power BI, so the dashboard is always up to date. She used the “Visualize classroom walkthrough data” template from the Flow template gallery which made it quick and easy to create the flow. In addition, Lauren has several standalone flows to automate day to day tasks. As one example, she setup a flow that lets teachers know when she’s left feedback for them in OneNote. Lauren started an initiative to get all her teachers on Teams to improve efficiency. They are now fully on Teams and use it every day to communicate and share information. 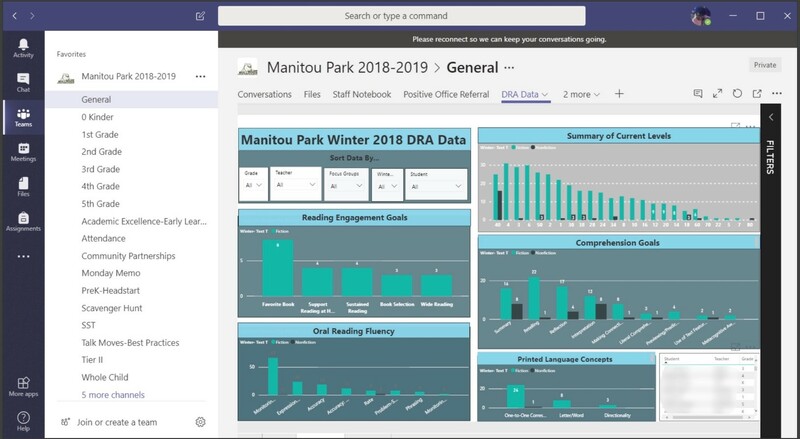 The DRA PowerApp and Power BI dashboards are embedded as tabs within Teams, making it easy to access without leaving an experience they’re already familiar with. 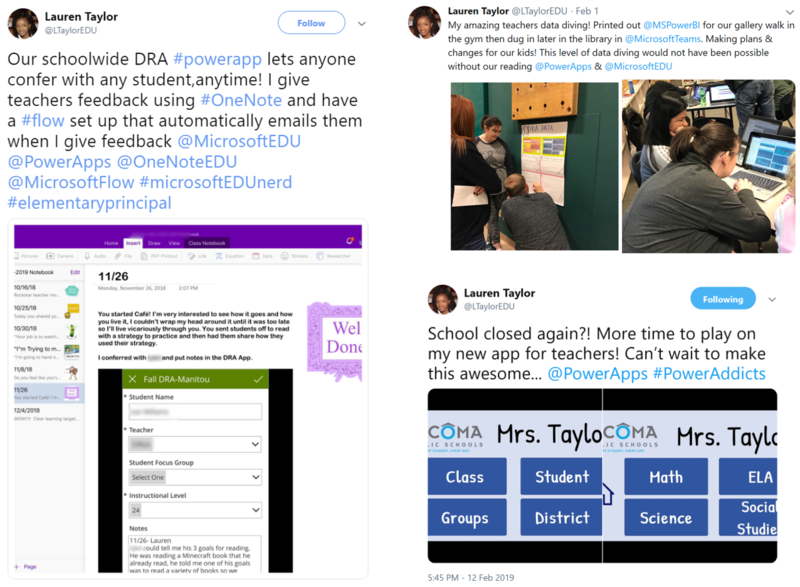 In a recent interview, Lauren talked about the different ways in which the DRA solution has benefited teachers, students and administrators, and shared her excitement around the potential of the Power Platform for her school and district. Q: How has the DRA app helped your teachers? Q: How has the DRA app helped your students? Q: How has the DRA app helped administrators? Q: What else has the Power Platform enabled you do to do that you couldn’t do before? Q: What do you envision yourself doing in the future with the Power Platform? 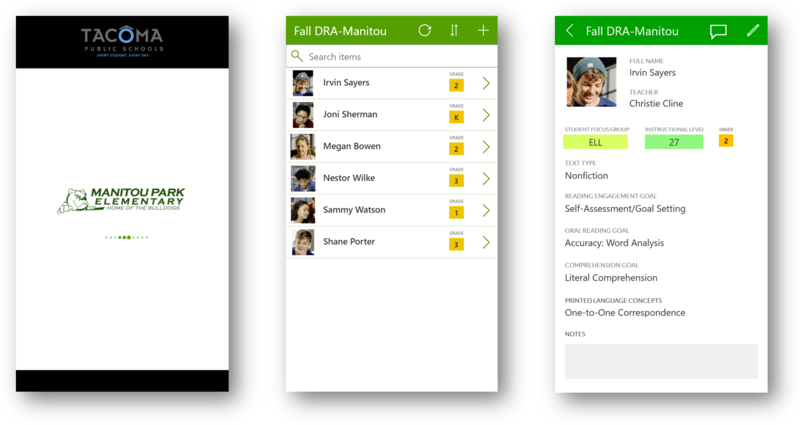 Mobile PowerApp used by teachers to capture detailed information from DRA2 assessments in a structured manner – several dropdown choices based on certain pre-set criteria. All data is stored in a SharePoint Online list and visualized in Power BI. The app and dashboard are also embedded in Teams for easy access. For additional customer stories on PowerApps and related technologies, visit http://aka.ms/PowerAppsStories and http://aka.ms/PowerAppsChamps.